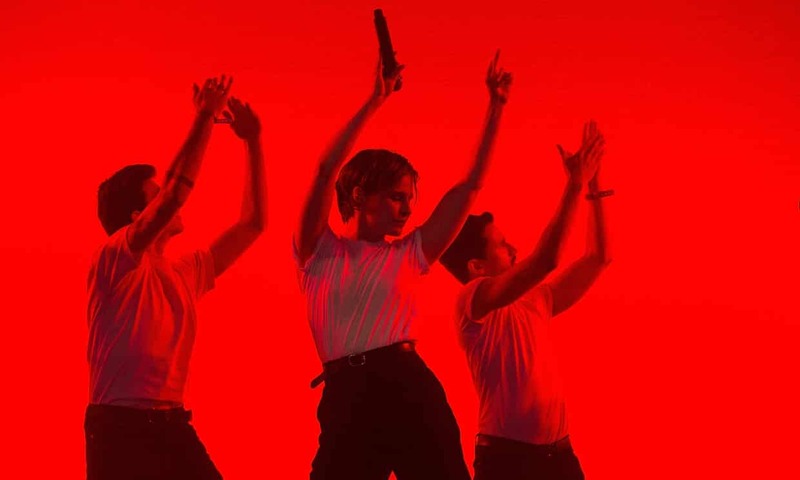 A few songs after making her crimson-clad, swaggering entrance, Héloïse Letissier of Christine & The Queens takes a moment to ponder her surroundings at the Royal Concert Hall, noting her pop show’s departure from the auditorium’s tendency for the classical. “I’m going to twist the solemnity of this venue,” she announces, “by being totally free, baby,” before launching into the French G-funk track ‘Le G’. Flanked by six deft and fascinating dancers, she performs against a backdrop of a lush mountain scene to the irresistible ‘Girlfriend’, lead single of the charged new album Chris. A few songs in, we are introduced to the persona of ‘Chris’ adopted for the album, who we are told was “born out of the desire to be a little freer.” True enough, the new album is dizzyingly bolder than the soft introspection of 2014’s Chaleur Humaine, and the newly-christened, short-haired Chris shimmers with this freedom (and with sweat), evangelising the audience by pronouncing us “free to recreate, to dissolve” if we so wish. Performed with the classic sensitivity of Christine & The Queens but mixed with the new bravado of Chris, older songs scrub up well. At one point, the mountain landscape falls away abruptly to reveal a new scene of tempestuous waves, against which Chris sings ‘iT’, Chaleur Humaine’s binary-blurring inquiry into gender, an impactful paragraph of the show’s love letter to change and instability. The debut’s closing track, ‘Here’, is swollen in grandeur and sees Chris turning her back to the audience and removing her shirt during its frenzied string section, distorting her body in a defamiliarizing meditation upon the strangeness of having one at all. ‘The Stranger’ provides another showcase of the dancers’ skill, as they contort themselves in slow motion into what resembles a moving Renaissance painting. Letissier’s theatrical background is constantly evident in the show’s directorial precision. Seamless transitions take the form of dance breaks – one to a snippet of Janet Jackson’s ‘Nasty’. This isn’t the only time she pays homage to her influences. At a charming lull, Chris encourages the audience to clap along to her own song ‘Nuit 17 à 52’, which she performs acapella, before bursting into a brief but well-received rendition of ‘Man in the Mirror’. Each song holds its own small narrative arc amplified by stage effects – during ‘Goya Soda’, Chris is pursued by one puckish dancer, who grasps at her without reciprocation for most of the number, only to literally go up in smoke and run off stage when the embrace is finally returned. The closing numbers continue this theme of anguish but intermingle intoxicatingly with joy and catharsis – ‘Doesn’t Matter’ touches upon ‘suicidal thoughts’ yet is a beautiful slice of danceable existentialism. Before ‘The Walker’, Chris explains its themes of carrying on even when one is wounded, encouraging us to “rely” upon her for its short duration. From the wrong artist it would be saccharine, but she’s done more than enough by this point to gain the audience’s trust. For the encore she emerges mid-crowd, shirtless and smiling, to perform ‘Saint Claude’, before bouncing back through the crowd with dancers in tow to the pounding beat of ‘Intranquilité’. Addressing the audience one last time, she encourages us to “stay soft, stay tender, stay daring.” Fuelled with optimism that infectious, we can certainly try.